Hi Christina, I just made a variation of your dessert while visiting at your mom's. We had a bunch of rhubarb and some frozen strawberries that the piano camp picked in NY. I added a package of strawberry jello for the sugar and a little thickening. The crumble topping was made with 1 cup of flour, 1/2 cup oatmeal, 1 stick of butter, cinnamon and nutmeg to taste. Baked at 350 for 30 minutes and 375 for 10 more minutes. We are just about to eat so we'll report later. Wow, that turned out really good!! Are you a clean as you go cook, or just make a complete mess like me? Mmm Sandy that sounds delicious! I don't think I've ever tried rhubarb! Biz I am a complete and total mess and disaster in the kitchen, much to Johnny's dismay. I splatter, spill, and drip liquids and powders everywhere. Then at the end I usually pile everything in a big bowl or the sink to consolidate and have to wipe/scrub everything and sometimes vacuum!!! haha It's BAD! Dude...this is practically the same thing as the recipe I gave you the other day! Remember the two fruit ones I sent you links to? Those just didn't have butter in them. When's our potluck?!? !I Can't waiiiit!!! now that's My kind of dessert! More fruit and natural sweetness! ...and with the crunchy topping for texture! Anne, I remember you sending me links to fruity things, I don't remember them being crumbles! Maybe I stored it in my subconscious. 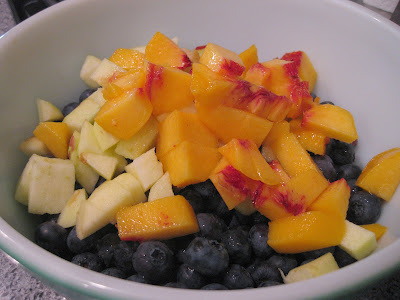 I was really in the mood for another blueberry peach pie, but didn't want to make a pie crust, haha. I'm with you, Sophia - give me fruit anyday for dessert. I don't really like sweet or chocolate. I need to make something like this! I want to make something that I can have as a special treat at night, but not have to make something every night.